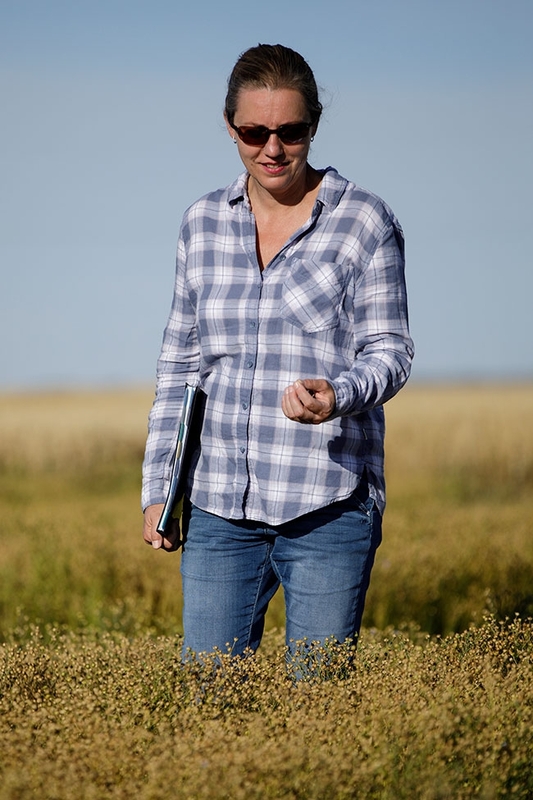 Being the only flax breeder in Western Canada puts the onus on Helen Booker to target traits that are of keen interest to flax growers, processors and users. Her program is working on a wide range of advances – from stronger disease resistance, greater adaptation to northern conditions, and increased yields, to larger seeds, yellow seed coats and higher alpha-linolenic acid (ALA) levels in the oil. “Western Canada has gone from three flax breeding programs to one in the last couple of years,” says Booker, who has been the flax breeder at the University of Saskatchewan’s Crop Development Centre (CDC) since 2009. She notes that the Agriculture and Agri-Food Canada (AAFC) flax program in Morden, Man., has shifted from breeding to agronomy research, and a private flax breeding program run by various companies over the years has closed up shop. Fortunately, Booker’s program is able to piggyback on the resources and infrastructure in place for the CDC’s other breeding programs. Also, Booker and her predecessor, Gordon Rowland, have developed some great flax cultivars that provide royalties to the breeding program from seed sales. Plus, collaborations with other researchers are feeding valuable data and tools into her breeding activities. And Booker and her collaborators have been able to access research funding from federal, provincial and grower sources to continue the program’s advances. Of course, Booker also wants to improve outcomes in the areas where flax is currently grown. So, she is aiming to increase yields in all production areas by improving such things as resistance to major diseases like pasmo, powdery mildew and Fusarium wilt, and resistance to drought. As well, she is working to improve seed quality traits that are important to the industrial, human health, and animal nutrition markets, such as increasing the ALA content. According to Booker, the yellow seed coat is an advantage for some uses because the seed coat doesn’t contain tannins. For example, if you mix ground yellow flaxseed into food products like pastas or bakery products, it won’t cause discolouration. “In 2017, I released a yellow seed variety called CDC Dorado. A seed grower group in southern Alberta called SeedNet is distributing it. CDC Dorado is the highest ALA line released by the CDC. It’s at 64 per cent ALA; most of the cultivars have around 55 per cent,” Booker says. In 2016, she registered a yellow cultivar called CDC Melyn, which is being distributed by Wayfinder Farms in Saskatchewan. Its yield is equal to AC Nugget’s, it is immune to flax rust and moderately resistant to Fusarium wilt and has an ALA content of 61 per cent. This year, Booker registered a brown linseed variety called CDC Rowland. “The breeder seed was grown this year. SeCan will distribute it, and they’ll have it ready for farmers in a couple of years,” she says. “CDC Rowland is named after my predecessor, Gordon Rowland, who started the flax breeding program at the CDC. It has a really high yield potential. Across Western Canada, its yield is 112 per cent of CDC Bethune, which is the yield standard. It has a late maturity rating equal to Flanders, and the yield potential actually is higher in the south. So in the longer growing season portion of the Black and Gray soil zones, it’s 117 per cent of Bethune. In the Brown soil zone, it’s about 116 per cent of Bethune. Helen Booker is working to improve a wide range of traits in her flax breeding program at the University of Saskatchewan. Over the past decade, a lot of work has been done in Canada to evaluate and characterize existing flax germplasm sources. For instance, Rowland and AAFC’s Sylvie Cloutier led a major Genome Canada project (2009 to 2014) that sequenced the flax genome and developed numerous genomics tools such as genetic maps and molecular markers. This work has continued, and they recently released an improved version of the flax genome sequence that rivals in quality the best crop reference sequences currently available. To help in the use of those tools, Axel Diederichsen with Plant Gene Resources of Canada (PGRC) created a set of about 400 accessions, called the flax core collection. This core collection is drawn from the PGRC’s flax world collection, which contains about 3,400 accessions of flax germplasm collected from all over the world. The core collection preserves the range of diversity present in the world collection. Booker, along with AAFC researchers including Scott Duguid, Sylvie Cloutier, Khalid Rashid and Frank You and others, worked together to evaluate the core collection for many agronomic, seed quality, fibre and disease resistance traits, at Morden and Saskatoon. The resulting dataset is a great resource for flax breeding. This research was funded by Genome Canada, AAFC, Western Grains Research Foundation, Saskatchewan Flax Development Commission, Flax Council of Canada and others. 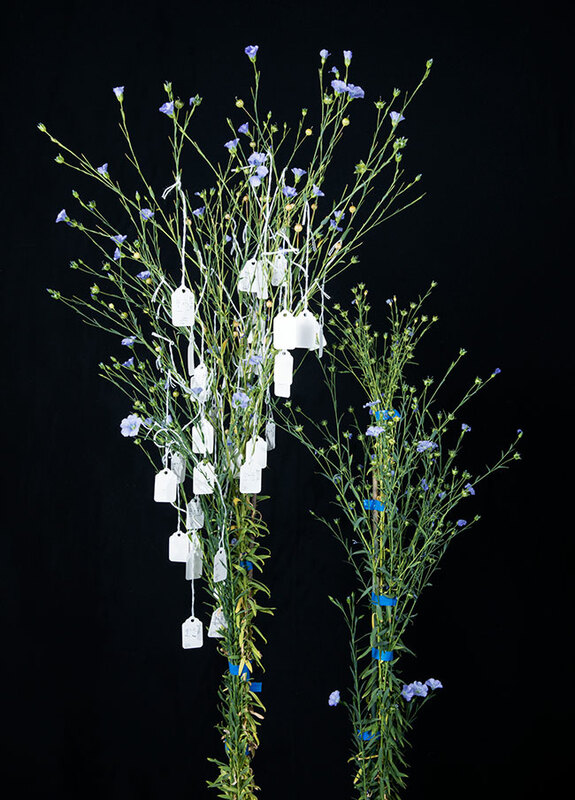 The AAFC researchers have genotyped the core collection and they are working on studies to identify the locations in the flax genome that affect various key traits. Booker and her AAFC colleagues will be submitting a proposal for a large-scale research project that would include a continuation of that work towards pinpointing the specific genes involved in important traits. Last year, Booker led a short project under Growing Forward 2 that involved QTL-seq. QTL-seq is a bioinformatics “pipeline” (a series of steps to analyze data) to rapidly analyze millions of DNA sequences to figure out how they relate to specific traits. “We obtained a flax population that was segregating for either resistance to powdery mildew or resistance to Fusarium wilt or both. We sequenced all the individuals in that population. Then we selected the extremes from the population, so the resistant or susceptible phenotypes,” she explains. By analyzing the sequence information for those resistant and susceptible groups, the researchers identified locations on the genome associated with resistance. “We identified a single location for powdery mildew resistance. Fusarium wilt involved a lot of small-effect locations, so we weren’t able to identify a single location that conditioned resistance to that disease,” she says. Another area of her program involves transferring useful traits from the wild relatives of flax into cultivated flax lines. “The wild progenitor of flax is Linum bienne, or pale flax. It is easily crossable with cultivated flax, Linum usitatissimum,” explains Booker. As part this research, she’s working on a step-wise approach to introgress pasmo resistance into an adapted background. First, she crossed Linum bienne with a CDC flax cultivar. Then she inbred those bienne-usitatissimum hybrids in the nursery until they became stable at the F6 (sixth generation) stage. The F6 hybrid lines didn’t perform very well agronomically because of the wild germplasm in their background, but Booker selected individual plants that showed resistance or moderate resistance to pasmo when tested in the pasmo nursery at Saskatoon by Kutcher’s group. Then she crossed those individuals back into CDC cultivars to try to improve some of the other traits in this material, while retaining pasmo resistance. Her research group has also started making “wide crosses” – crosses with more distantly related wild relatives of flax, which can be quite challenging. Booker and her CDC colleague Gaofeng Jia recently published their work to develop a more up-to-date statistical pipeline for estimating agronomic traits using data from multi-environment field tests, such as variety trials. She will be using this analysis pipeline to calculate more accurate yield potential estimates for new flax cultivars in the Prairie-wide regional tests of registered cultivars, and she will provide those estimates in the Seed Guide flax tables. To better reflect shared environmental conditions, the flax yield data will be grouped into three regions: the Brown soil zone; the longer-season region of the Black and Gray soil zones; and the shorter-season region of the Black and Gray soil zones. Booker says this new approach will be more helpful for growers when choosing varieties suited to the conditions on their farm. And it will allow breeders to better pinpoint the best performing and most stable genotypes as their lines go through multiple field trials. Overall, Booker and her collaborators have lots of studies underway that will contribute to the development of even better flax varieties. And she says many new projects will be coming along soon as the Canadian Agricultural Partners research funding program is rolled out. 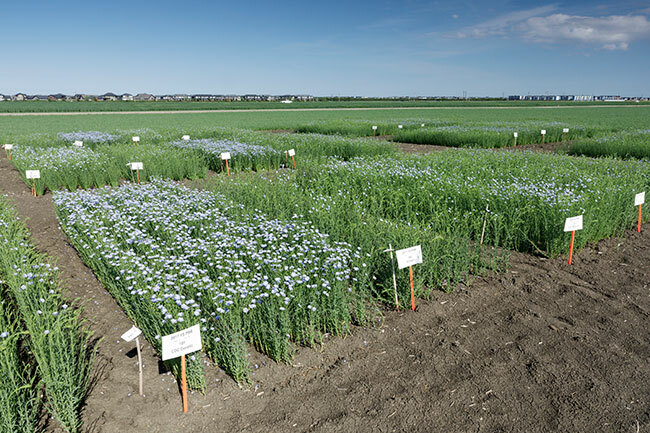 The future looks bright for continued improvement of flax varieties for Western Canada.